If you’re visiting Thailand then there’s a good chance you may head up north to Chiang Mai. If you have the time (or you are on a budget or just like to do things differently and avoid the tourist crowds, like me) then a great alternative to flying to Chiang Mai is to take a bus and make an overnight stopover at the half way point (5 hours from each destination), the ancient capital of Sukhothai. 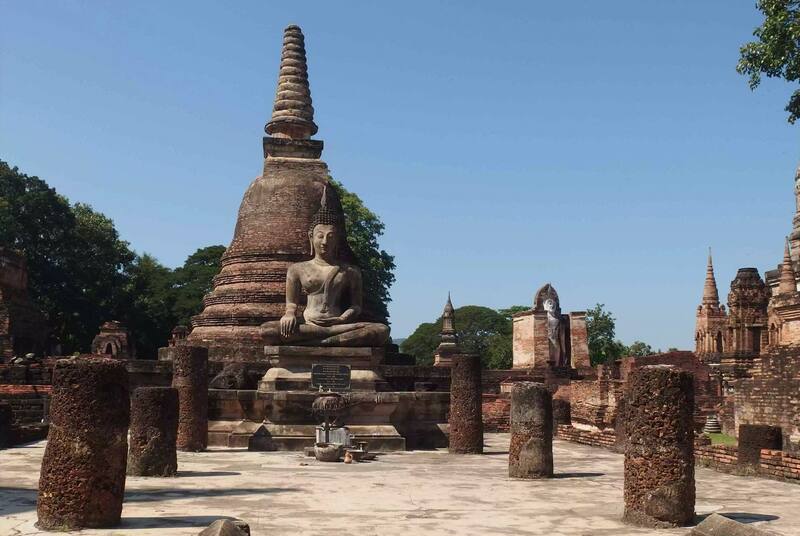 Sukhothai was the first capital of Thailand, The ruins from this time are now world heritage listed. I arrived by bus from the north. Sukhothai is divided into two parts, the old town (where the ruins are located) and the new town 12km to the east (where the bus station is and the bus was scheduled to stop). The ruins beckoned as we drove past so rather than wait to get off the bus in the new town, I asked the driver to drop me at the entrance to the ruins. Although there are limited hotel options close to the ruins (there are some very nice resorts in the area I’ve since discovered), I was quickly able to find a small guesthouse that was cheap and cheerful. I dropped my bags and immediately rented one of the many bicycles available around the ruins entrance (the best way to visit the ruins is by bicycle). Within minutes I had a bike (30 baht or $1 for a day) and had become friends with the fish seller across the road who had the back tray of his truck filled with water and live catfish (constant surprises wherever you look in Thailand). I purchased my ticket for the ruins (100 baht or $3) and set off. The area of the ruins is lovely – very peaceful and full of large trees and lakes. There are few tourists around so you often have a ruin to yourself. I spent the afternoon slowly cycling around, taking photos, eating some great food and generally relaxing. The park itself is not very large – a few hours is all you’ll need. Come late afternoon and the place emptied out as most people left back to the main town – a real pity for them as the sun setting over the ruins is stunning! As the sun fell behind the hills, lights were turned on which lit the ruins into a magical wonderland, something I’m glad I didn’t miss (a great reason to stay in the old town). I enjoyed a delicious Thai dinner from one of several Thai restaurants lining the road close to the park, before heading to bed early. The next morning I decided to visit the ruins further afield and enjoy a nice bike ride through the countryside. It was a lovely morning of cycling on quiet country roads, some reading and a little meditation as I found myself alone in most of the ancient ruins. In the afternoon I grabbed my bags and headed off. Sukhothai is LGBT friendly (as with everywhere in Thailand) and a very nice detour to make if heading north from Bangkok. You’ll only need a day to explore everything (you could possibly even do it in an afternoon). But why not slow down and enjoy the pace of life of a less-visited but still very much beautiful and historic part of Thailand.